I cook Mexican food in phases. I’ll make salsa and guac a few nights in a row, then Salsa Chicken the next night, and eventually I get around to mojitos (which I learned to make with fake sugar simple syrup and they are AWESOME–way better than they sound). Then I remember how much I enjoy cooking Mexican! It’s easy, healthy, and people generally like it. I think the spice is best rubbed on chicken right before cooking. Making the spice blend ahead sets you up for a quick and easy dinner. I identify myself as unusual, and here’s why: I recently recognized raking leaves as a 2014 top fall memory. With the identification comes a story. A college friend and I spent our fall break at my house in Minnesota. My friend comes from Hawaii, where leaves don’t fall (weird! ), so she had never before raked leaves. Shockingly, I found myself excited to head to the yard with my family and friend for her first leaf gathering experience, and even more shockingly, I enjoyed being out there. Thus, raking leaves is a fond memory. Afterwards the girls went for manicures and pedicures, perhaps favorably tainting my thoughts. Fall is here, temperatures are dropping, and famers market season is wrapping up, so I’m making the most of the last fall vegetables: broccoli, onions, and parsley. Steam broccoli until still slightly firm, about 6 minutes. In a large skillet, heat butter and olive oil on medium high. Place mahi mahi in skillet, season with parsley, salt, and pepper; and cook for about 5 minutes. 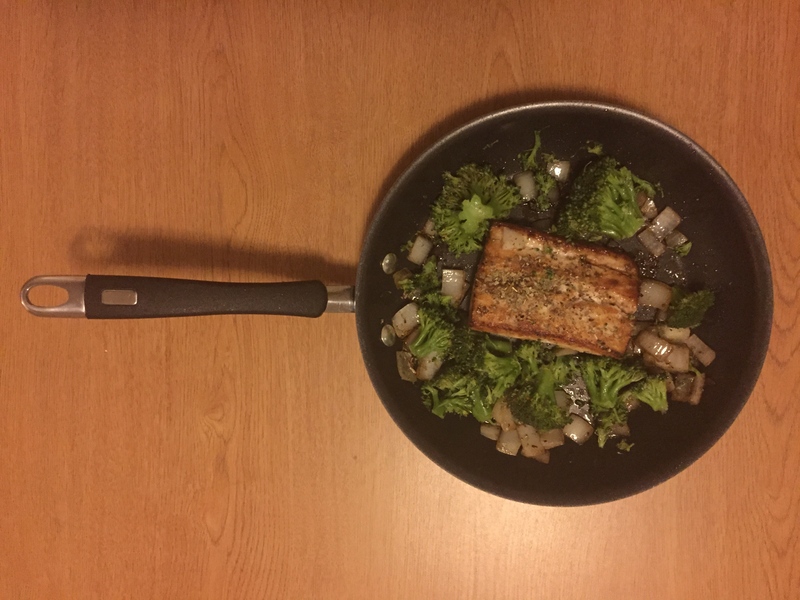 Turn mahi mahi and add onion to skillet, sautéing until mahi mahi is cooked through and onion is translucent, 4-6 minutes. Turn heat to low, add broccoli, balsamic vinegar, and garnish with extra parsley. Stir to mix flavors and serve. You know how people crave chips sometimes? That happens to me with seafood. Actually, it happens with chips, too, so maybe I should think of a better example. 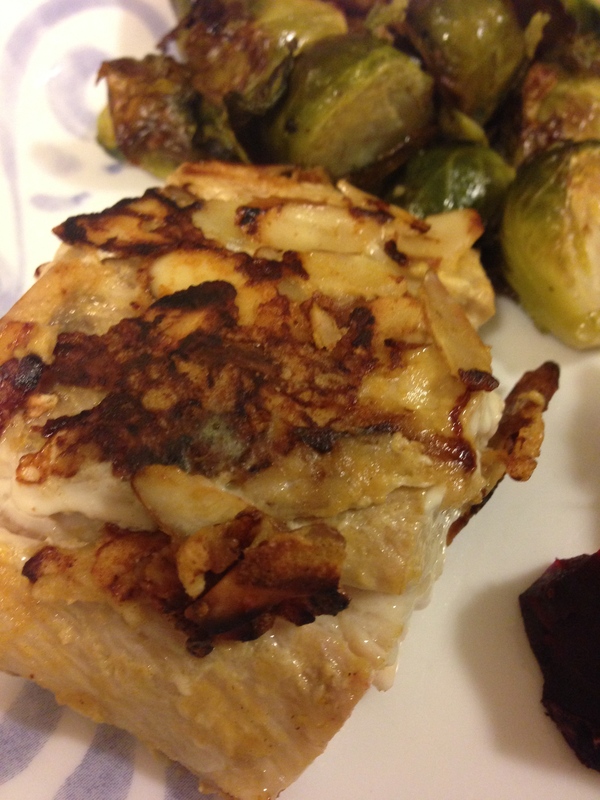 Almond Parmesan Crusted Mahi Mahi satisfies my seafood craving. By the way, spellcheck doesn’t recognize “mahi mahi.” That’s what the bag says, so that’s what I write. This terrible Chicago winter continues, so I have little motivation to eat meals out. Eating out means I have to go from the apartment to the car, from the car to the restaurant, from the restaurant to the car and from the car to the apartment. In “Chiberia,” that is too much. Of course, if I’m already out, I can eliminate the trip from the apartment to the car, so then I can go out. The point of the last paragraph was that since I’m home more, I cook more. And I cook fish because I like it. This is a simple pan-fried fish, and you might even have all the ingredients on hand. It’s simple, yet sophisticated; a last minute entree. In a small, flat bowl, combine dijon mustard, soy sauce, lemon juice and onion powder. 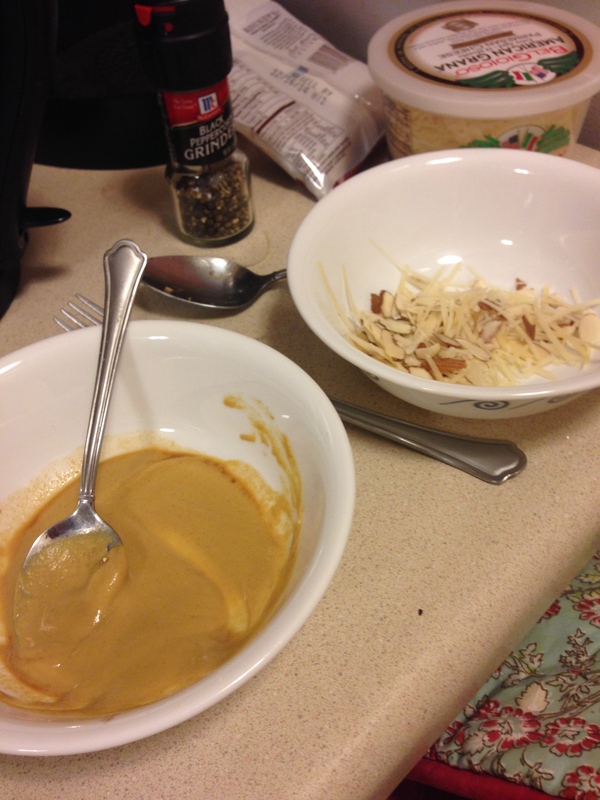 In another small, flat bowl, combine almonds and parmesan cheese. Grease skillet with olive oil. Take one mahi mahi filet, and coat it with the dijon mustard mixture. Then dip, the filet in the almond mixture. Repeat with remaining filets, and place in skillet. Cook fish until cooked through, about 4 minutes on each side.